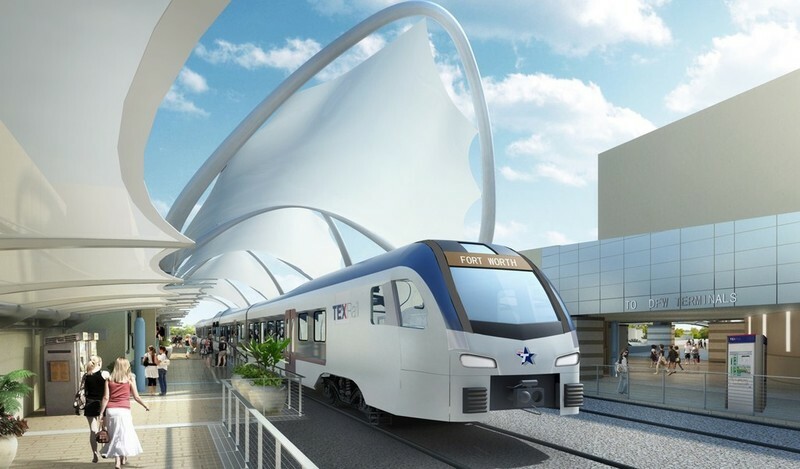 TexRail to receive $499 million from the FTA Full Funding Agreement over several years. electricron wrote: TexRail to receive $499 million from the FTA Full Funding Agreement over several years. The trains are expected to operate about every half-hour during peak periods — 44 trains per day — and carry about 9,000 daily passengers by the end of its first year, and 14,000 by 2035. At one point Stadler was going to build rail cars here in DFW. I guess that plant went to Salt Lake. ^That was a big, mulit-level house of cards that really could have been something great --- wasn't that a deal wrapped around funding the Dallas and Fort Worth sides of the Cotton Belt, Stadler manufacturing plant and controlling interest in a bunch of land at one or two of the TexRail/Cotton Belt station(s), a train load of Federal Dollars and maybe a couple other contingencies but it just didn't come together. ^They tried, went to at least one meeting on it and thought it sounded fairly positive for our region then the whole thing just went dark as most of these things do. Later I guess it showed up in Salt Lake. Salt Lake had fairly good facilities available for building trains ready for immediate occupancy, the DFW area didn't. And the Salt Lake facilities will also be used to build KISS (double level EMU) style trains for Caltrain. 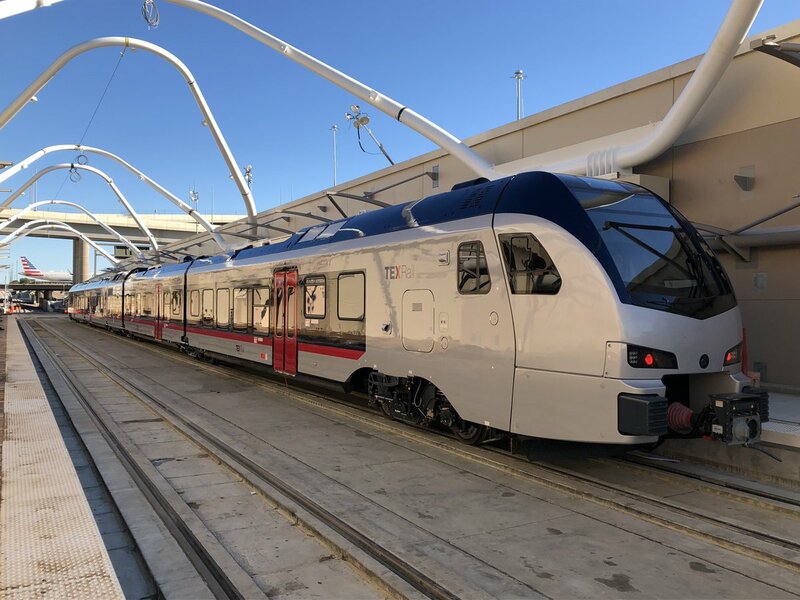 While the Salt Lake facility will need remodeling for building trains, it's large enough to handle all of Stadler's business needs, and it came with local tax offsets making it even more attractive to them. While there was hope Stadler would have chosen a Texas facility, Stadler never guaranteed where they would build the trains. They did look everywhere in the USA, including Texas, but Utah won. 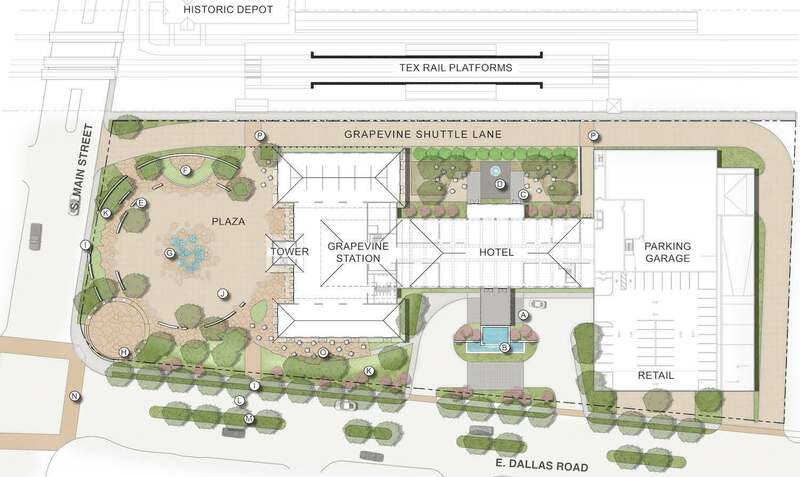 Grapevine plans to build a hotel, plaza, garage and retail at their station. Link w/ source & additional info. Archer Western has been selected to build a new $28.5m TEX Rail station next to Terminal B at Dallas Fort Worth International Airport (DFW) in the US. The Terminal B station will serve as the last stop in TEX Rail's proposed 27-mile commuter rail project, which is currently being built by the Archer Western Herzog joint venture. Connecting downtown Fort Worth and DFW Airport, the line will improve commuting times to and from Fort Worth. 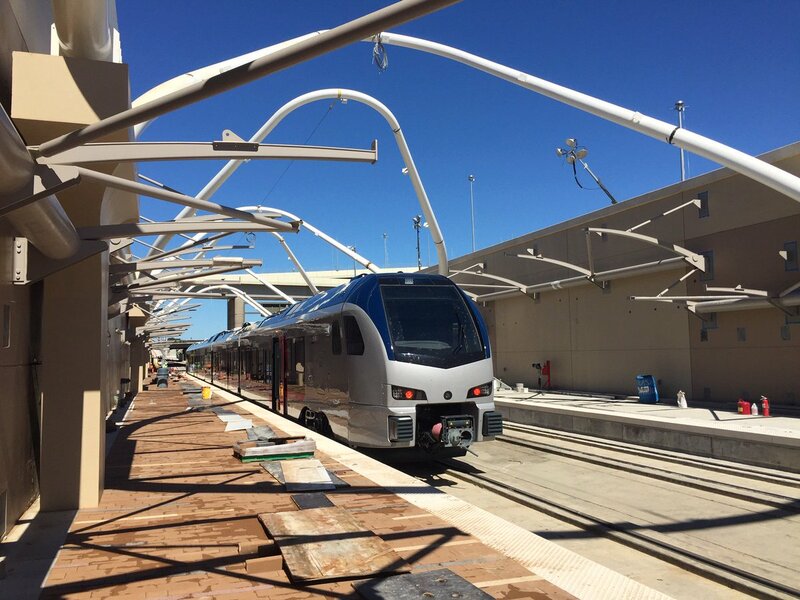 It will begin service next year and also features a walkway connecting to the existing Dallas Area Rapid Transit (DART) station located adjacent to Terminal A. ^ Looks like they have included more fake potted plants in this station too. The DART station plants are very dusty. Here is a presentation that The-T made to the Tarrant Reginal Transporation Coalition last week. It shows some of the remderings shown in the above post but also includes actual construction photos. If you scroll passed the construction section you will find photos of the train assembly now going on in Salt Lake City. Last edited by SlandersonCooper on 15 Jun 2017 08:06, edited 1 time in total. ...still don't understand why Colleyville fought this deal. tamtagon wrote: ...still don't understand why Colleyville fought this deal. They fought it because they'll see little benefits because they will not use it. They will not use it because they will not have a station. They will not have a station because they aren't participating with FWTA in any way. They can't participate with FWTA because they are using their extra 1% City sales taxes for other purposes. They will probably be singing a different tune if they were funding FWTA with a half cent sales tax. A recent transit expo in Atlanta included a display of a Stadler rail car which is the model and paint job which will be used for the TexRail route. According to the article, entryways into the cars will be level (similar to the middle section on DART's light rail cars) so no steps up--easier for those who need accessible entries or who have rolling luggage. The cars will have conductor positions in front and back (also like DART's light rail) so no need for turntables to turn the cars around. The first TexRail cars arrived yesterday in Grapevine. Meanwhile, a parking area and platform for the Grapevine station will be ready by the time TexRail starts rolling in December 2018, followed by the train station, a 150-foot tall clock tower, and an adjacent hotel (called Hotel Vin -- for 'wine' in French, of course -- which will have 121 rooms and be branded as part of the Autograph Collection by Marriott) all of which will be open by June 2019. The parking area will be paid parking, to discourage use of it by those going to DFW Airport on the TexRail. The overpass bridge that will span TX 114-TX 121 and approach to DFW for the TexRail is coming along. View from the westbound 114-121 service road. Concrete supports are in place from the highway northward, and bridge beams were recently put into place atop the supports. On the DFW Airport property, North Airfield Drive has been diverted while a new bridge is built to go over the path of the upcoming TexRail tracks. The new North Airfield bridge is shown from both directions along the detour, as well as the point (looking north-northwest) where the TexRail path will go under the bridge. Looking at the eastbound 114-121 angle, concrete supports are coming together which will be the base for the bridge to carry TexRail trains over the highway. Just south of the eastbound service road, the foundation is coming together for the south embankment of the bridge and the approach to the north side of the main airport property. The Grapevine Main district is a public/private project to be built around a five-story old-style train station with 105-foot observation tower, 121-room hotel, shops, restaurants and meeting room spaces. Construction on the project is underway at the corner of Main Street and Dallas Road in Grapevine’s downtown area. *edit: Sorry this is old news... but they did just break ground, so that is awesome. Railcar testing going on now, and still some sections left to finish, but it's still scheduled for completion by the end of the year. Having passenger rail service between the big airport and downtown Fort Worth will totally pay off. Still befuddled by Colleyville's rejection of a station, but whatever. The growing residential population in Downtown area (please build an extension to the Cultural District right away) gains a significant quality of life advantage, and even if ridership is slow to build, the city gains a powerful marketing tool when it begins in earnest to recruit new office workers. I really hope this does help Downtown Fort Worth as well. DFW would be an absolute power house if Fort Worth were to kick it up a notch. Colleyville is likely acting like Corinth did about the DCTA A-Train and Knox-Henderson about the DART light rail subway section. They'll figure out later on (probably too late) that it'll be an asset, not a liability. jrd1964 wrote: Colleyville is likely acting like Corinth did about the DCTA A-Train and Knox-Henderson about the DART light rail subway section. They'll figure out later on (probably too late) that it'll be an asset, not a liability. You're probably correct, a decade or two from now they will probably wish they had a train station. But take a look at how Colleyville interfaces with the railroad corridor today with Google Maps or other satellite image web sites. At best there's just four grade crossings and none of them are lined with commercial real estate. There really isn't a good site for a well used train station. within that city's limits. Even in England there are lousy, unused train stations because the surrounding neighborhoods could not support one well, in a nation that rides trains and public transit far more frequently than we do in Texas. Geoff Marshall has posted many youtube videos of least used stations - and some of them bewilders why a train station was ever built there. Surprisingly many of Geoff's videos are very entertaining, so I recommend watching as many of them as you can! But I'm not here to plug Geoff, I'm posting to suggest there are good places to place train stations and there are lousy places to place them too. I really don't see a good place to place a train station today in Colleyville. Maybe decades from now another through avenue with lots of commercial real estate will get built and my opinion will change. Development is coming along at several of the future TexRail stations. jrd1964 wrote: Development is coming along at several of the future TexRail stations. DART trains and TexRail though are different animals so let's recognize that TexRail is more like DCTA than its like DART trains. DART light rail brings inner ring suburb commuters into the city and back home in the evening reiterating the bedroom community paradigm that the highway system created. DART uses a hybrid light rail that attempts to balance the benefits of inner city heavy rail and commuter light rail while mostly serving commuters and some inner city back and forth transit users who attempt to use it as a subway system. Just compare the stations and train choices. TexRail and DCTA stations and trains have long distance travel design schemes while DART tries to accommodate the rapid on and off concept of inner city transit systems around the world. DCTA and TexRail will be primarily about moving suburbanites into Downtown and back again with some airport cross travel. DCTA, of course, connecting Denton commuters during the weekday into the inner city DART service area. DART does have trouble making station development patterns a benefit for them though and DCTA and TexRail seem to have a clearer head about what they are and aren't. DCTA and TexRail primarily a suburban commuter connector. DART a mix of suburban commuter long distance travel and inner city transit trying to serve two different paradigms without a serious understanding of the inner city transit problem. longhorn wrote: When does service start? Here is a June 6 note from KRLD. A VIP train will run on December 31 and regular service will begin Saturday, January 5. I cant wait to ride this train. Anyone have a regional transit map of DFW? I'd like to see how this looks. While I am really happy that DFW is now connected to both cities, still a little bummed they couldn't figure out the engineering needed to make the trains pull in through the same station. We need to make public transport more convenient. ContriveDallasite wrote: While I am really happy that DFW is now connected to both cities, still a little bummed they couldn't figure out the engineering needed to make the trains pull in through the same station. We need to make public transport more convenient. There is a short walkway between the 2. Not much more than going between DART light rail and TRE at Union Station or Victory Station, or most of the bus-->train connections at any station that has both. Even if they pulled into the same station, they could not share the same tracks and platforms. You will still need to swap platforms. Light rail trains and buses are regulated by the FTA (Federal Transit Authority) while commuter and freight trains are regulated by the FRA (Federal Railroad Administration). Needless to say the two federal regulators have and use different regulations, so different it's impossible to run the two different type of trains on the same tracks simultaneously. It would require at least 4 tracks and 3 platforms to run both train types to the same station, and after a quick look at both stations at DFW airport that would seem impossible. There's barely room for 2 tracks and 2 platforms at both of them. Take an overhead look at the downtown train stations in both Dallas and Fort Worth and note how wide the stations are, then try to imagine placing these wide stations in near DFW Terminals A and B. Note I wrote near, not a half mile away. On top of that, how many people are realistically going to connect from DART to TexRail at DFW? There's just not enough ridership to justify the cost when it's less than 1000 feet to walk from one platform midpoint to the other. In fact, I'd argue that building out a station in terminal B makes things more convenient, as someone can now arrive at either A or B with checked luggage and have a decently covered/protected walk to either station, and not need to deal with the shuttle buses. Obviously a consolidated bag check/security facility in the median with elevators up to a new skylink station would be ideal, but I don't think there's enough ridership to justify that. Remember back when DART wanted to partner with FW to do this as one project? At the time, I was bummed that FW didn't want to play nice. But now, seeing how DART loves to over-engineer everything, it would have ended up costing much more, and delivering way later than what TexRail ended up with. Kudos to them, I guess. It looks like service will start January 5, 2019. That's getting close! They already posted timetables and it appears it will run daily every hour. I'm surprised there is no difference between weekday and weekday schedules, but I'm glad there seems to be Sunday service. Since TRE still doesn't offer Sunday service doing the connection at DFW will be the only way to get between the two cities. At least it's better than now. The running time will be 51 to 52 minutes between end points. Yes, TEX and CB will both use the two platforms at DFW Terminal B Station. A good chunk of the route between Terminal B and DFW north is single track, so that (plus some other arcane rail switching/signaling/scheduling considerations) effectively limits peak frequency to 30 minutes on the DART side of things. I think TEX frequencies are limited to hourly along the rest of their route, as their ROW is largely single track, while DART has planned double track for most of their ROW. I think there's a spare platform at DFW North that would allow for trains to terminate there, giving some theoretical extra frequencies on the double-tracked CB at the expense of serving the airport directly. Texrail to be free for January. I've seen the trains several times now rolling over 114 and around Grapevine! Slick trains! Redblock wrote: Texrail to be free for January. I need to figure out a free day next month. Can't wait to try this out, to check out the view from the TexRail angle, as well compare/contrast with TRE and DCTA's A-Train. Love that there will be a Sunday train connection to/from Fort Worth. I don't know if this video was already posted, but I just found this look inside a TexRail car, as well as part of a speech by Grapevine's mayor. Dignitaries and VIPs rode an inaugural run of a TexRail train to DFW today. I still don't understand why Collyville rejected a station.